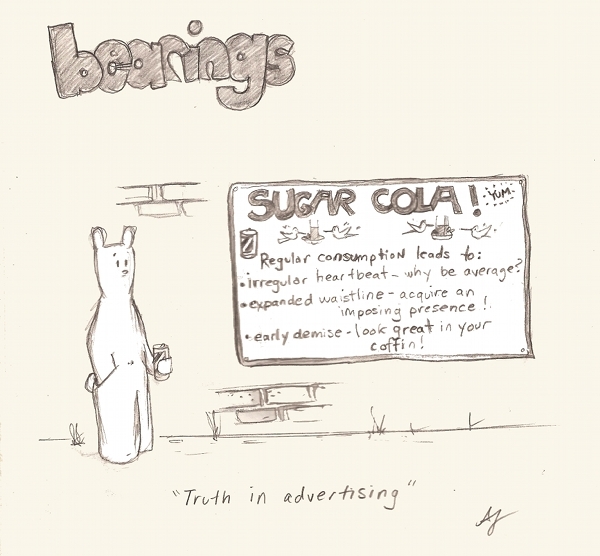 This entry was posted in Bearings Cartoons, Fluff & social commentary and tagged bearings cartoon, philosophy webcomic, simon and finn, truth in advertising, truth in advertising comic, truth in advertising joke by simonandfinn. Bookmark the permalink. I see you have a “spinning” theme going 🙂 And I would not be one bit surprised if your ad lines were actually for real in some boardroom…especially in light of things like “job creation” being clearly identified in environmental assessment reports as a side-“benefit” of environmental disasters. Hey I didn’t even realize there was a spinning theme going, how observant! Wonder why that’s on my (subconscious) mind. Yes, re: job creation correlation to environmental disaster it’s like some terrible satire. I’m sure you heard the one about the Exxon Valdez spill increasing the GDP reported.